Spiritual-Gateway: "Ve-Ve Diagrammes Rituels du Voudou : Ritual Voodoo Diagrams : Blasones de los Vodu - Trilingual ed. 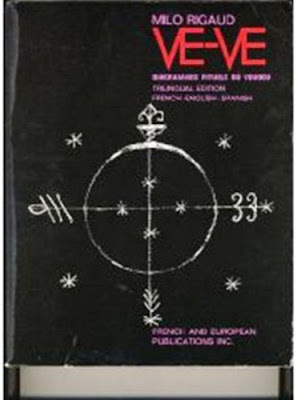 French English Spanish (French and English Edition)"
"Ve-Ve Diagrammes Rituels du Voudou : Ritual Voodoo Diagrams : Blasones de los Vodu - Trilingual ed. French English Spanish (French and English Edition)"
There are many books on Voodoo available to one interested in the particulars of that path. However, you would be hard pressed to find a more useful guide than the books of Milo Rigaud. This particular book which can be considered a working manual combined with "Secrets of Voodoo" are not only excellent straight forward introductions to this way but a source of practical information for the user as well. Perhaps the most important benefit to the reader is the fact that these books are written without the egotistical bent that accompany most books in this field.